The items are listed from weakest to strongest. With the Morton Strong Line (SL25), a thin copper plated steel strip, you can strengthen your stained glass panel from the inside. Fits either copper foil or lead came work. Invisible in the finished work. 25 feet long, 0.020 inches thick, 0.114 inches wide. 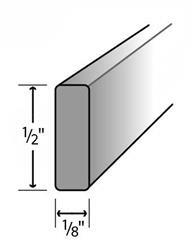 Galvanized Flat Steel Reinforcing Bar 1/4" x 1/8"
Galvanized flat steel reinforcing bar, 1/4" x 1/8" x 6 feet. IMPORTANT NOTE: We will cut these into two 3-foot lengths for shipping. If you want 6-foot lengths, you will need to also select, "Special Packing for Long Items". This is to help cover the extra UPS charges and the heavy-duty cardboard tubes or box that we'll send the bars in. 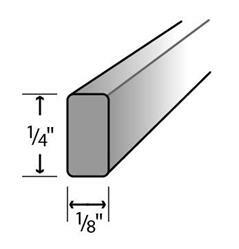 Galvanized Flat Steel Reinforcing Bar 1/2" x 1/8"
Galvanized flat steel reinforcing bar, 1/2" x 1/8" x 6'.